Even with the regular dental care, people will have problems in their oral cavities, which can lead to the loss of tooth or more than one tooth. Gingivitis, tooth decay, or accidents and injuries can be common causes. Sometimes, large scale surgeries in the facial region can lead to dental problems. Reasons for tooth loss could be many and these are seen in clinical dentistry practice in large numbers these days. When a tooth is lost, it has to be removed from its base or roots. As a result, there will be absence of the tooth from its place. Sometimes, accidents lead to the breaking of the root, while in decays, the root has to be removed because it is completely eroded. In order to fill in the place of the lost tooth, dental implant is the modern method of artificial replacements for natural tooth or roots in India. They are considered to be alternatives to partial or full bridges or even for dentures. Dentist in Delhi offers to provide these surgical processes of implant dentistry to put in new prosthesis in requisite patients. In a way, the dental implant will work like a tooth, providing more stability and strength than dentures. Not only teeth implants help in returning your ability to chew and smile like before, they also improves the facial appearance. Morphologically, a dental implant is a cylindrical or screw like anchor, which is fixed into the upper or lower jaws, depending on the tooth loss. By surgical method in dental implant clinic in India, it is inserted into the bone and provides a stable base for the artificial tooth. In other words, the teeth implants now act as the root of the tooth and crown or the denture or the bridge can be placed on this implant and create a naturally looking tooth in complete shape and size. Dental implant doesn’t require removal everyday or in small intervals, or cleaning in certain solutions. They will remain fixed to the bone for years together. This feels like a natural tooth with roots, without any alterations in the adjacent teeth. Surgical methods dental implantologist in dental implant clinic in India are required to fit in the implant, which can be done in different sittings. The manner, in which the surgical implant dentistry process is undertaken, depends much on the type of implant and the general condition of the jaw bone. For the implant to get fixed properly there will be time required for the bone around it to heal. Depending on this, it may take a few weeks or some months for the process to be over. But, at the end of it all, you have real looking teeth without feeling anything wrong in the oral cavity, which is not the case with braces because these braces constantly make the presence felt for a foreign object. This kind of implant done by dentist in Delhi is the simplest of the procedures, where one missing tooth is replaced by a new crown and an implant underneath it. In such cases, a titanium implant is put into the jaw bone and allowed for osseointegration. There is a cap or abutment, which then holds the crown of the new tooth on its surface with the help of screws. It can be fitted in similar shape as that of the adjacent teeth and hence, there is no gap or erosion from adjacent areas. For disease conditions or trauma leading to loss of many teeth, dental implants can be a beneficial and permanent solution. It will provide a natural look to the teeth after restoration and will help in proper stimulation of the jaw bone. With multiple teeth loss, there is a greater area of absence of any tooth. As a result, exposure of the jaw bone is more and without restoration, the bone can get eroded. Multiple teeth implants are good for people, who are growing old and have to replace a number of falling teeth. Bridges and dentures were in common use since many years in dental clinics in Delhi. But, these are not without lacuna. Bridges do not address the issue of bone loss. Since the bridge requires adjacent healthy tooth to be affixed, it cannot be done for a number of teeth. Furthermore, there are spaces left in between the tooth, when bridges and dentures are applied. Various procedures of multiple teeth implants are found nowadays, which can help in permanent solutions. In case where all the teeth are missing, people will require dentures to be fitted in the place of the original teeth. This can be done in dental implant clinic in Delhi, by putting in implants in the jaw, across the entire length in the upper and lower jaws and then putting in full dentures or full bridges over the implants. In such procedures, multiple implants can be put across the jawbone and fixed bridge is supported. Even though the fitting of the implants is similar to single or multiple implants, it will require proper coordination and treatment plans to make it successful. The number of implants required for full arch fixed bridge is different depending on the particular anatomical structure of the jaw, amount of strong bone and number of teeth one wants to put in the prosthesis. Zygomatic form of implant is done in cases in dental clinics in India, where the upper jaw bone is thin or brittle and cannot sustain the usual implants. In zygomatic implants, there is a long implant, which can be fixed into the cheek bone, passing through the maxillary sinus. By fixing this implant, a complete upper denture can be placed on this implant. It is supposed to be a novel approach by dental implantologist in Delhi, in cases where there is severe bone loss in upper jaw. While it might not be believed by many people, who have undergone restorative surgeries of dental implants, there are some cases of complete denture replacements, which are done in a single day in dental implant clinic in India. It is possible for you to get dental implants and dentures in a single day, usually by the all-on-four procedure by the expertise of dentists in India. Under this scheme of things, the full arch of teeth is fitted on four implants on the upper jaw and four in the lower jaw. Clinics providing teeth in a day implant treatments can make it possible by having check-up, x-rays, planning and surgeries in a single day. Nowadays, such dental implants in India are taken up in many dental clinics, so that people get new set of teeth or dentures, simply by having four implants in their upper and lower jaws respectively. The reason so many people are going for dental implants is primarily based on the advantages that this procedure has to offer to people, who have lost their teeth. It is equally effective for a single tooth replacement, as it is for a number of teeth. These have obvious advantages over the conventional forms of dentures and braces, for which the dental implants have become quite well known. People prefer these techniques of implant dentistry over the use of artificial or removal tooth or braces. The foremost advantage of dental implant for you is the natural look and feel like one’s original tooth imparted by these materials. Since the implant material of titanium fuses with the bones, they are very much stable and almost become permanent. Smooth speech is possible because of the fixed tooth, in contrast to dentures, which had the chances of coming out during talking. Also, in anticipation of loosening of the braces, people are afraid to talk clearly and loudly or laugh out loud. Secure fit is the feature of dental implants, for which it is preferred by a lot of people in India. Healthy nearby teeth are not required to be polished or reduced, in order to fit the braces or tooth-supported bridge. An implant can be fitted in such a way that it matches with the neighbouring teeth. Hence, erosion of the jaw bone or the gums is not found with the implants. Such a manoeuvre with the teeth allows better maintenance of oral hygiene. Since the dental implant is a permanent part of the dentition now, it wouldn’t trouble you like the dentures. It is also not necessary to remove it regularly or clean it with solutions. At night, the dentures are required to be removed. Eating is easier with the implants, as it allows chewing any kind of food like the normal tooth. Dentures are liable to slip or break or get dislodged if something hard is chewed upon. Even, these do not have any pain because enough time has been allowed for the osteointegration process to fuse the base of the implant with the jaw bone. There is also not much surgery required, so that the gum is not exposed or the bone and adjacent teeth are not eroded. With so many advantages of the dental implants done by dental implant clinic in India, over the conventional bridges and dentures, it is conclusive that people are willing to go for dental implants in case of teeth loss. Furthermore, such a procedure is possible to be done in a number of kinds of dental problems, in case of old age and when all the teeth are missing. Treatment procedures in dental implant fitting can be of different types, depending on the number of implants required to be fitted in India. 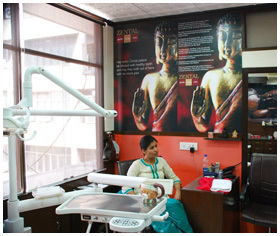 In the single implant for single teeth loss, the process by dental implantologist in India is the simplest. For fitting multiple implants also, the same procedure is required, although it may take a bit longer for allowing all the implants to get properly ossified with the jaw bone. Osseointegration is supposed to be the basis for successful teeth prosthesis. Once the implant is fitted, the gingiva around it is secured for the blood supply to be sufficient. This may take some more time. Then an abutment is fixed over the implant and an impression for the crown is created. After the abutment is sealed properly with gingiva, then it is fixed with cement over this space to create the full tooth. In case of multiple teeth loss also, this process is followed by most of the advanced dentists in Delhi. In case of loss of all teeth, as it happens in old age usually, prosthesis or dentures are required. Separate full-bridges are required, which would be then fixed on to these implants. Sometimes, due to lack of sufficient bony surface to fix the implants, we go for bone grafting and ridge modifications in our dental clinic in Delhi. Such processes can further increase the time for completion of the dental implant treatments. But, proper bony bases are necessary for implants to hold for long years. Calculations of the dental implants cost is not possible by simply looking at the number of teeth lost. Since it is a surgical procedure, requiring a number of sittings and attendance at the clinics in Delhi, the costs can vary from one case to another. Hence, the best way to get an estimate of the dental implants cost would be to go for consultation in a dental implant clinic in Delhi or have a dentist in our clinics look at the requirements. A few years ago, such procedures were extremely costly, even for the restoration of a single tooth. It came around the figure of 100 thousand Dollars or so. Apart from that, such a process included visits to a number of dentists and for a number of times. But nowadays, with all the types of Dental Implantologist available under one roof at our set up, the cost of single implant can be around four thousand dollars while full fixed bridges on implants cost about 25,000 Dollars. Prices vary according to the need of the patient, but the one thing that is assured is that best quality dental implants in India can now be availed at quite low costs in various parts of the world. For the success of teeth implants, it is important to have the bone of the jaws to be strong and sufficient enough to give a holding to the implant. Due to periodontal diseases or by means of tooth erosion, sometimes there is very thin bone or brittle bone. This is a difficult situation for the surgeries to be performed. When dentists have such cases to handle, they usually go for bone regeneration as a first step in the reconstructive surgery. In case of the back side upper tooth, there is the process of sinus augmentation, where the sinus floor is raised to provide enough bone for the tooth. Sometimes, bisposphonates are added to the area around the implants to regenerate bone in a natural manner. Bone regrafting is also a method used in some cases. In case of sinus augmentation, there is the need to regenerate the bones first, before the implant is proceeded with. Ridge modification is another way of strengthening the jaw bones. These are required in cases of deformities in the upper and lower jaws, where ridges are uneven. Such deformities might be congenital, erosion or constant wearing of dentures or trauma. These defects are filled up with bone tissue or bone forming materials, which are helpful in regeneration of the bone in case of dental implants. In most procedures of dental implants, a considerable time is required for bone regeneration, to enable the prosthesis to fit properly.